Home Comfort food Did We Enjoy The Raclette Cheese Sandwich at Morris Grilled Cheese ? Did We Enjoy The Raclette Cheese Sandwich at Morris Grilled Cheese ? We felt like devouring a Raclette Cheese Sandwich. So, as part of our celebration of Grilled Cheese Month, we stopped by the Morris Truck to see what they’ve been up to lately. 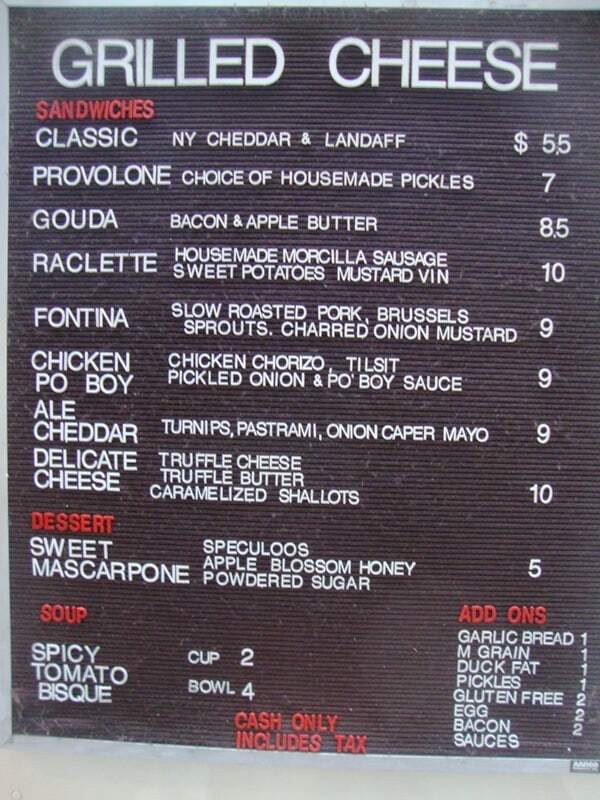 One of the things we like about the Morris Truck is they are always changing up the menu. You never know what you’re going to get, and their ingredients are often seasonal. On this trip, we were tempted by the morcilla sausage and raclette cheese sandwich, which cost $10. This was the highest priced item on the menu, but homemade morcilla sausage sounded too good to pass up. The Morris Truck always grills the sandwiches nicely, but their true talent lies in the combination of ingredients. The person in the truck described morcilla sausage as a currywurst, but it’s actually blood sausage, usually made with pig’s blood. That may not sound appetizing to everyone, but the sausage had a mild flavor that worked well with the gooey cheese. The raclette cheese sandwich did not have a strong flavor either, but the texture was great for grilled cheese. It stayed soft, warm and stretchy throughout the entire lunch. The secret ingredient here was the sweet potato. It sneaked through the cheese and sausage to become our favorite part of the Raclette Cheese Sandwich. Another interesting, satisfying grilled cheese from the Morris Truck. You can find the Morris Truck on twitter here or on our Mobile Munchies twitter feed. Earlier this week, the Morris Truck was on CBS This Morning showing everyone how to make their Ale Cheddar Cheese. Click here for the video. Next articleHow Are Carpe Donut’s Organic Donuts ?